After months and months of horrible winter weather, spring has finally sprung. And just as April showers bring May flowers, spring also means babies — lots of them: baby birds, baby mammals, babies everywhere. Usually, babies are up in their nests or safely hidden in their dens where they belong, but sometimes they wind up out in the open. If you happen upon a baby in the wild, what should you do? The Humane Society of the United States likewise cautions that unless a baby wild animal is visibly, “injured or in distress” (for instance: bleeding or broken or with their dead parent nearby), “there may be no need to rescue them.” The most important thing to do is to wait and to watch from a distance in order to truly assess whether the animal has been abandoned. You need to give the parent(s) time and opportunity to return. The Human Society website is a great resource for simple information about the natural behaviors of different species of wildlife and can help you to assess whether a baby is in need of assistance. A mother deer or a mother rabbit only visits her offspring a few times a day. A fawn sitting alone or baby bunnies in an undisturbed nest are typically not an immediate cause for concern. A baby bunny may only be four inches long but if its eyes are open and its ears are erect it is already independent. Contrary to popular opinion, birds will not abandon their young if a person touches them. 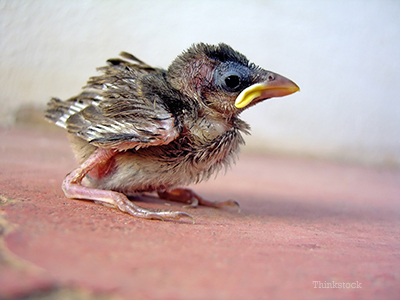 So if you find baby birds that have fallen from their nest and are not visibly injured, you should put them back if you can safely do so. How can you help protect local wildlife? This brings up the next issue — what you can do to protect your resident wildlife from becoming orphans? The key is to remember that this is the season when the little ones are most vulnerable, especially if you’re going to be working outdoors and disturbing their environment. For instance, ideally you should prune your trees and shrubs during the winter months. And if you didn’t, procrastinate a little longer to allow the newborns to mature. If you absolutely have to do spring or summer pruning, just be aware. Look very carefully for active nests before you cut (even at dead trees since many animals prefer such nesting spots). Make noise to alert the adults that you are approaching and work slowly. If you do find an injured or abandoned animal in need of assistance, first protect yourself. Wear gloves or use a towel to somehow get the animal safely into a box or a carrier. Secure the animal in a warm, safe and quiet location and then contact your local wildlife center as soon as possible. This may be your first encounter with an orphaned puppy (or is it a fox? ), but the experts will know what to do.